Paintings by Andy Newman at Woods Hill Table. Whose Idea Newman and Maguire are regulars at Woods Hill, and one of their kids even worked there for a spell. Owner Kristin Canty considers the couple good friends, and she wanted to showcase Newman’s work. She got her chance during Boston’s ArtWeek, when restaurants make a dish inspired by a favorite artist, then donate a portion of the proceeds to charity. Canty hung 20 of Newman’s paintings in celebration, and she offered a farm egg with asparagus and a beet margarita to honor his pastoral vision. “Andy’s like family to me. He and Greg are just the most happy, smiley, sunshine-y people,” Canty says. (In other words, they’re not wicked at all.) 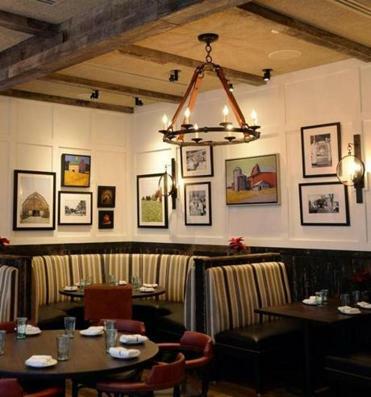 The paintings still hang throughout the dining room, and they’re for sale.